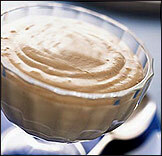 It's National Mousse Day...so mousse it up, HG style! Begin by preheating oven to 350 degrees. In a blender or food processor, grind Fiber One to a breadcrumb-like consistency. Combine crumbs with melted butter and stir until well mixed. In an oven-safe pie dish sprayed with nonstick spray, evenly distribute Fiber One mixture, using your hands or a flat utensil to press & form the crust. Use your fingers to press it into the edges and up along the sides of the dish. Bake pie crust for 10 minutes. Set aside. In a separate dish, dissolve gelatin mix into 2 cups boiling water. Stir for 2 minutes, or until completely dissolved. Stir in 1 cup of cold water, and place in fridge for about 1 1/2 hours, but NO LONGER (Jell-O should be jiggly, but not firm). Next, use a mixer to fold in Cool Whip. Once mixture is very well blended, pour evenly into pie crust. Use a flat utensil to smooth out surface. Refrigerate for several hours until firm. If desired, garnish pie with sliced strawberries. Serves 8. Begin by pouring 1 tbsp. of chocolate syrup into each cone. 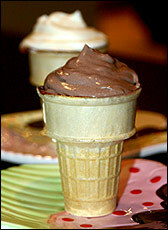 Swirl around until inside of cone is well coated; place in freezer immediately. In a small dish, combine Cool Whip and pudding; stir until blended. Place dish in freezer for 45 minutes to 1 hour. Remove cones and mousse mixture. Spoon mousse evenly into and on top of cones. Optional: Top each cone with a drizzle of the sugar-free syrup! Serves 2. This one is so easy to make a chimp could do it (but where are you going to find a chimp who happens to have Better 'n Peanut Butter handy?). Just whip ingredients together until well blended and dig in. Serves 1! Here are some of our favorite ways to enjoy this miraculous mousse: With Nabisco 100 Calories Packs Oreo Thin Crisps (make lil’ sandwiches and freeze ‘em, or enjoy ‘em Dunkaroo-style! )...with apple slices...rolled up in low-cal dessert crepes...topped with Fiber One cereal...spread on Wonder Light toast...drizzled with sugar-free chocolate syrup. Yum! HG's favorite low-cal mousse mix is made by Sans Sucre. It's low in calories and fat -- and it tastes GREAT. Plus, it comes in flavors like Chocolate Cheesecake, Key Lime Pie, French Vanilla and more!